In an interview Sunday, the former Federal Reserve chairman said that more financial firms will fail and that housing won't stabilize until 2009. WASHINGTON (CNN) -- The U.S. credit squeeze has brought on a "once-in-a-century" financial crisis that is likely to claim more big firms before it eases, former Federal Reserve chief Alan Greenspan said Sunday. "I can't believe we could have a once-in-a-century type of financial crisis without a significant impact on the real economy globally, and I think that indeed is what is in the process of occurring," he said. While recent declines in the prices of oil and food may help avert a recession, he said, "I wouldn't put my money on it." The financial crunch already has claimed investment bank Bear Stearns, spurred the federal seizure of mortgage giants Fannie Mae (FNM, Fortune 500) and Freddie Mac (FRE, Fortune 500) and left century-old Wall Street institution Lehman Brothers (LEH, Fortune 500) clinging by its fingernails after suffering nearly $7 billion in real estate-related losses. Federal regulators and Wall Street executives were holding weekend crisis talks aimed at resolving the Lehman situation without further shock to the financial sector. 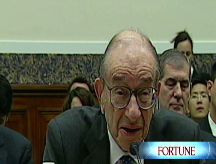 Greenspan, who left office in 2006, said he expected more failures before the crisis eases. While regulators "shouldn't try to protect every single institution," he said, companies should be kept from failing "in a sharply disruptive manner" to prevent further shocks. Greenspan's critics say he helped inflate the housing bubble by keeping target short-term rates too low for too long, leading to reckless lending and borrowing in the housing market. But Greenspan has said the problem lay not in the loans themselves, but in their repackaging as securities and sale to investors.